Not sure where to begin your college research? 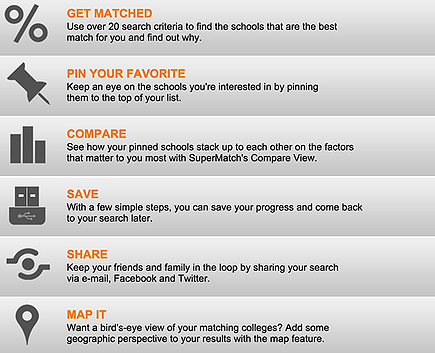 There are tons of online resources to help students match up with the right schools. In this article, I'll outline ten of the best sites to conduct your college search and then explain how to get started researching colleges using three of the best sites. Within each section, the sites are ordered from the absolute best to those that are still good but not #1. If you've just begun researching colleges and need some help finding schools you might be interested in, check out these sites to help get you started. This is a good place to find out about colleges if you’re just starting out in your search. It caters to students who might not know where to begin and guides you through the research process. There's a guide called "College Search Step-by-Step" for students who are unsure of how to go about the search process. It will ask specific questions about what you are looking for in a school and give you a "snapshot" of your preferences to help you decide where to apply. On the main college search page, you can find college matches based on different criteria that you’re interested in, or you can search for schools directly. You can also compare schools, but the amount of data is less staggering than some other sites, so it may be easier to digest. If you’re a more scientifically minded person, this site will probably appeal to you. You have the option to start your search with a specific college, a topic that interests you, or with building your own table of different variables to compare schools across any metric you choose. This site has a huge amount of data for each school that includes variables such as economic and racial diversity of the student body and extensive statistics on debt and financial aid. This is a helpful resource for comparing colleges side by side based on hard data. You can choose a “focus” school and a “comparison” school, and the site will list the data for each school in table format. It's a good way to get an objective viewpoint on what each school is like. If you’re not as interested in looking at a bunch of data you may find this site to be overwhelming, but if you’re trying to find an easy way to compare school stats without having to create a profile this is the place to go. This is just a screenshot of the top of the comparison charts - there are many more statistics that show up below this. This site (put out by the National Center for Educational Statistics) doesn’t have the prettiest interface, but it’s useful for finding reliable data about any college in the country. If you already know what school you want, you can search for it directly. You can also search by state or even area code. There are filters for degree level and type of college as well, so you can search for just public or private colleges or just 4-year colleges. Each college has a page that lists relevant data including information about cost and financial aid, admissions, programs offered, graduation rates, athletics, and other general statistics. The downside of this site is that the information can be overwhelming and difficult to digest because there is so much data. If you prefer something less dry and scientific you might want to look elsewhere, but if you’re just looking for the facts with no frills this is a good resource. This next section highlights sites that are best for when you already have an idea of which schools you're thinking about and are interested in comparing them and learning more about whether they're really a good fit. This is a great site for comparing schools, calculating admissions chances, calculating financial aid, and just figuring out if a school is a good match for you in general. You will be asked to create a profile, which then allows the site to figure out which schools might work best based on what matters most to you. There are also student reviews, so in addition to comparing hard data you will also be able to compare how people feel about the school. There’s even a feature that helps you plan campus visits! 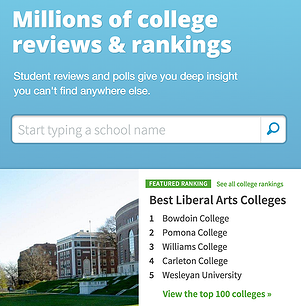 This site has one of the best balances between comprehensive data and a user-friendly experience that tells you what you really want to know about colleges. It will even take you as far as your application! Each school that you put on your list of favorites has a link that takes you directly to the school's website where you can begin the application process. 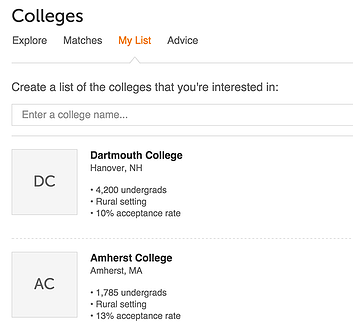 On Chegg's college matchmaking site, you can create a profile and see which schools might be right for you. This site can be very helpful in your college search because it lets you keep a running list of schools that you’re interested in once you create a profile. Design-wise, it’s nice to look at, and the statistics are presented in a very user-friendly, simple way that’s easy to understand. You’ll also find grades based on student reviews for everything from campus dining to academics to the party scene, so you can get an inside look at what people really think about the school. Based on these grades, the site has lists of schools that have the “best quality of life”, “best merit aid”, and many other categories that may help you narrow down your search. There’s also a tool on each college page for you to enter your GPA and SAT/ACT scores and see your chances of admission. One issue with student ratings is that they are very subjective and may not always reflect the truth about the school. Before you take these as fact, make sure you also check out the school’s main website and see what they have to say about themselves. This site contains less hard data, but is relatively easy to use and makes the college search a little more fun (they even give grades for the attractiveness of the student body...very important in choosing your dream school). This site gives you access to tons of statistics as well as student reviews and letter grades for different aspects of student life (this is actually where the college grades on Chegg, a site I recommend later, come from). You’ll also see lists of the best schools in different categories based on reviews. If you’re looking for a comprehensive overview of what’s offered by colleges, this is a great resource. There are a lot of statistics to wade through, but you can also create a free profile and get matched up with colleges. This site is nice because it can get really technical and specific, but it also gives you the tools to search for schools without feeling too overwhelmed. You can keep a running list of schools that you’re interested in, and the site will help you notify representatives for these schools of your interest if you think any of them are especially good matches. One aspect of Niche that I'm not so crazy about is the amount of distracting promotions and ads for other related sites that are involved. It makes things a bit more cluttered and confusing to navigate and kind of turned me off from using this site despite the fact that it presents a lot of great information. You might be familiar with College Confidential for its (sometimes less than trustworthy) discussion forums, but it also has a great college search feature. You can fill out your preferences in over 20 different categories including location, majors, Greek life, party scene, and special services. Based on your answers and how important these factors are to you, you’ll get matched with schools that fit you best (out of a database of over 4,500 schools that includes schools outside of the US). You can also create a list of schools that you like by “pinning” your favorites. To narrow down your search even further, you can compare your top choices in different areas to see how they measure up against each other. You can save and share your lists if you want as well! I’d recommend this as a starting point if you're not sure which schools you’re interested in - it will help you figure out what’s most important to you and give you some initial ideas. It's super easy to pin and compare schools, although the information pages are a little confusing and not as nice to look at as the school matching interface. If you click on a school, you are linked out to another site called "College View" for the statistics, which makes things a bit harder to navigate compared to other sites where all information is internal. Get it? Go to Uni? It sounds like the Brits are responsible for this one, which made me suspicious, but this site is pretty cool. It has a modern design and includes tons of reviews in written and video format from students at the colleges. 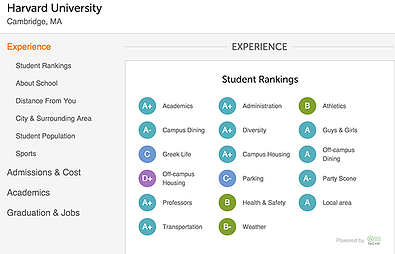 Based on student feedback, schools are rated on a scale of 1-10 for a bunch of different factors including campus safety, political activity, arts culture, Greek life, intellectual life, and more. Each college page has financial aid and admissions statistics, a built in map of the surrounding area, and statistics on student life such as the number of campus organizations and Greek houses.You can also make a list of schools and compare them across different metrics like tuition and selectivity. It does seem like they’re still working on adding more statistics about academics, so this site is a bit light on data in some areas. Still, it’s fun to use and will give you a different perspective than other sites with its multimedia format; there are lots of pictures of schools from students in addition to the video reviews. Once you have a pretty solid list of which colleges you want to apply to, you can use these sites to help you navigate college applications and paying for school. This site is oriented towards helping students search for scholarships, but it will also help you find colleges that may interest you. You can set up an account for free that will allow you to locate colleges and scholarships that fit your specific needs. There are helpful blog articles on the site as well that have advice on scholarships and colleges. You can also search for student loans on Fastweb - you just have to answer a few questions and you’ll get a list of all your loan choices. This site is a nice user-friendly means of finding scholarships and loans that will help you to avoid getting too overwhelmed with your options. It’s also a good site to keep in mind going forward, since it has resources for career planning and finding internship opportunities as well. If you're practically-minded and are serious about finding scholarships, you should definitely try this site out. You may want to use another platform for the college search process because Fastweb doesn't have as much information or tools for finding colleges as it does for finding scholarships and loans. This site is good for learning about application timelines and getting yourself organized for college as well as searching for schools that meet your criteria. There are articles with helpful tips about choosing colleges, applying to college, and getting financial aid and scholarships. 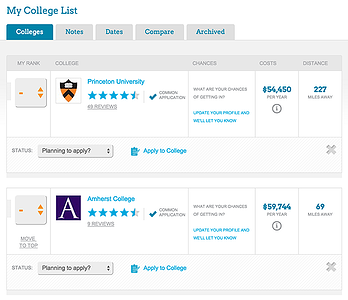 You'll get fast stats about colleges and suggestions about other schools that you may like based on your searches. This isn’t my favorite site in terms of its presentation of college statistics. However, it does provide advice in other areas that is more specific than other sites and may help answer questions you have about the application process and how to actually follow through on your college decision. Your mind is probably reeling from all of these options, so to make it easier, below is how we recommend you get started. The three sites described in this section are the best ones for beginning your college search, and I'll explain exactly how to use them. As we mentioned above, Cappex is an excellent site for helping you figure out which types of schools you're interested in and which fit you well. Below are the steps to get the most out of Cappex. 1. Create a profile - you'll answer a lot of questions about your college preferences including location, size, selectivity, and religious affiliation as well as questions about your GPA and scores. This gives the site an idea of what colleges may fit with your needs. You also have the opportunity to enter in schools that interest you if you already have options in mind. If you hover over any of the schools, you'll get an at-a-glance stats panel that shows you whether the school is public or private, its tuition rates, and the number of students. The first row of schools is for colleges that you may be interested in, and the second row is for colleges that are interested in you based on your level of high school achievement. 3. Click on the link inside the stats panel for any school that catches your interest. Once you get to the next page, you'll have a ton of information at your fingertips. One helpful feature that you probably want to check first is "Your Fit", which is the fourth button down on the left side panel. This gives you an easy way to tell if the college matches up well with the preferences you indicated in your profile. 4. Explore the college a little more. Think about other things that are important to you and whether they fit well with what the college offers. 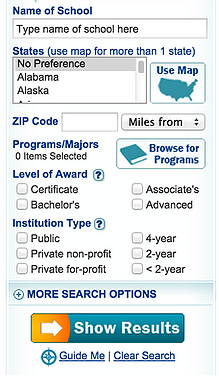 You'll notice that in each college profile you can comb through a huge database of information by clicking on the options on the left. Categories include everything from campus life to student reviews to application deadlines. Before you get too confused from all the information, try making a list of what you think will make you happy at college and target your browsing to the areas that matter most to you. Notice that you can rank colleges by how much you like them, and if you update your profile you'll see your chances of admission as well. The list also makes it easy to compare colleges. 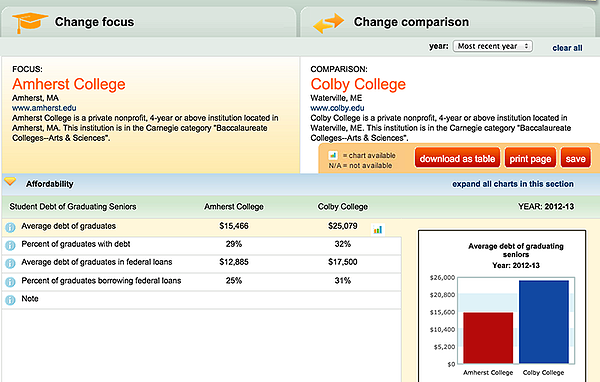 If you click on the "compare" tab you can compare colleges side by side in admissions, tuition, diversity, and campus life (this could be a good way to give your parents the hard facts about why you prefer one school over another that they think is better). 6. After you're satisfied with your list, you can apply to schools by clicking on the "apply to college" link beneath every list entry. This will send you directly to the admissions site for the school and make it easy for you to get your application started. 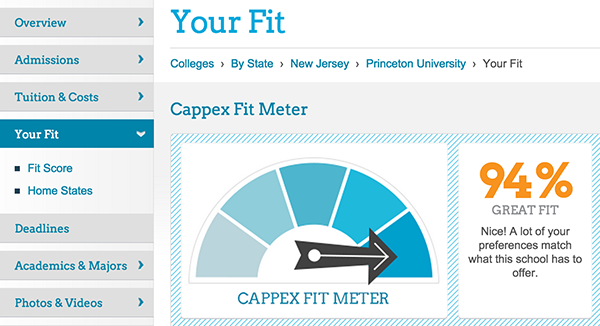 Once you've made a preliminary list of colleges with Cappex, we recommend next using Chegg to refine your list and see if there are any schools you missed. Below are the steps for getting the most out of Chegg. 1. Login through Facebook or sign up manually for a profile. Make sure you fill out as much information as you can in your profile so that your college matches will be as accurate as possible. 2. 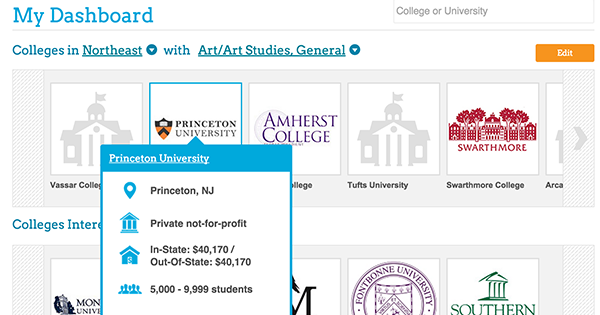 Click on the "Colleges" tab at the top of the screen, and you'll get to a page where you can search for schools by name or sort schools by your preferences. You can also look at lists of schools that are provided for you on the site based on student ratings for different things like "best food" or "most beautiful campus". 3. Once you see a college that looks promising, go to the page for the school and start exploring the statistics and ratings. You can even look at your chances of admission based on your GPA and scores. Again, I would recommend writing down some factors that are important to you for a college before you dive into the stats so that you have a more focused approach. I think a good thing about this site is that it doesn't go too heavy on the nitty gritty statistics. It boils it down to the basic things you probably want to know and also gives you perspective from real students. 4. Add any college you think sounds good to your list of schools. Once you add a college to your list, you will have the option to fill out information that will allow colleges you are interested in to contact you. You can then compare up to five schools side by side based on scores, admission requirements, tuition, and other basic facts. This should help you narrow your search down significantly. 5. 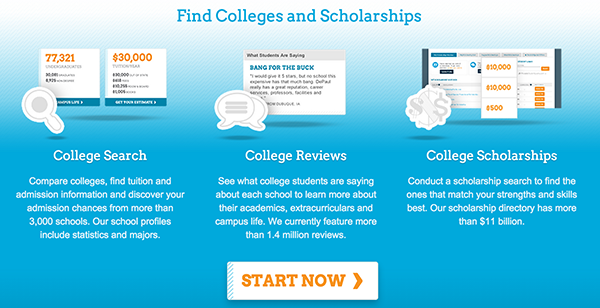 Take a look at other features of the site - you can also use Chegg to find scholarships and internships! Fastweb is the best way to find scholarships, which is a super important part of the college application process. You can also find colleges on Fastweb, but it's not as streamlined as the other options. We recommend using Fastweb after you've used Cappex and Chegg to get a list of colleges you're interested in applying to. 1. Fill out a free profile, providing as many details as possible about your interests and strengths as possible. This will help you get matched to scholarships that are appropriate for your specific talents. You can sort scholarships by deadline, amount, and provider. This is an awesome resource - instead of traversing the internet, you can see all of your potential scholarships right here. 3. If you click on the link for a scholarship and think you're interested, you can use the dropdown menu on the right to mark it as one that you "might apply" or "will apply" to; this will add it to your list under one of those tabs. This will make it easy for you to keep track of which scholarships interest you and which ones you promised yourself you would apply for (because we all know how easy it is to say you're going to apply and how hard it is to actually follow through). As I mentioned, the college search features on this site aren't quite as comprehensive as the others because there's no way to compare schools and there aren't as many student reviews or user-friendly statistics. You CAN use it to make a list, but I'd say Fastweb is mostly for scholarships. 5. If you want, start looking into your student loan options! This is a really daunting process that is made easier by the Student Lending Center feature under the Student Loans section of Fastweb. You can also get help with navigating the financial aid process under the Financial Aid tab and finding internships under the Career Planning tab. Basically, for anything involving the practical concerns associated with college, Fastweb is the best place to go. All of these sites will help you out in one way or another to narrow down your search, but I believe the top three have the best combination of user friendly format, solid information, and fun interactive features that are also very helpful to students. Remember to focus solely on what is most important to you in your search. You may have never heard of a school, but that doesn't mean it won't be a perfect fit. Be honest with yourself and you'll end up making a great choice! Aiming high in your college search? Read this article on how to get into the top schools in the nation. If you're worried about your chances of getting into college period, check out this list of the easiest schools to get into. Building a killer college application is hard work. Find out the how to create a versatile application and what not to do in your college essay. The Common Application makes it easy to apply to a bunch of different schools but only fill out one application! 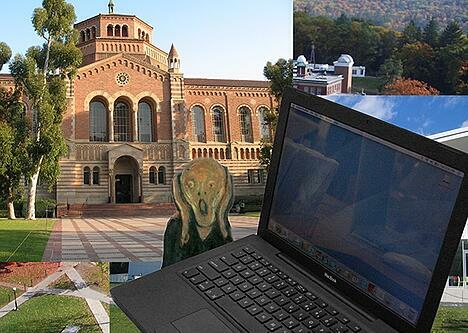 Find out which schools accept the Common App.